This updated edition of the industry’s premier business training program will give your students and school a competitive edge. 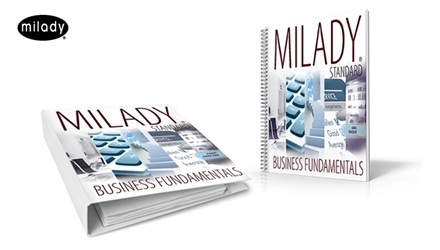 Easy to use and implement into your existing curriculum, Milady Standard Business Fundamentals is filled with student tools that will create students who are better prepared to succeed in the professional industry. It also includes extensive instructor training that will develop the teaching skills of your instructors and help elevate enrollment and increase retail and service revenue for your school. 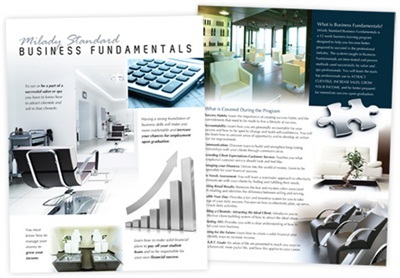 An entirely new Instructor Resource Website created specifically for Business Fundamentals instructors to assist them in teaching each lesson via a digital copy of the Course Management Guide, instructor training webinars, instructor support slides, video content, audio files, and more. A CourseMate to provide instructors with all of the reporting tools needed to track student progress while students access the Student Course Book and Goal Tracker online, along with other assignments and tools to help them study. A completely redesigned Student Course Book with new content including profiles from industry icons, an entirely new chapter titled “Success Habits,” information on repaying student loans, reporting income, marketing with social media, and more. An all-new, spiral-bound Goal Tracker/Appointment Book for students to set and track their goals, including retail units sold, referrals, clients served, and more. A Course Management Guide that is now complete with learning objectives, lesson plans, activities, evaluation rubrics and multiple choice tests. Redesigned Marketing Tools to market the program. To receive a review copy or place an order, click here.